G-Drive mini is a high performance stylish portable drive by G-Technology. Available in variants up to 1TB in storage size and equipped with a 7200rpm harddrive, the G-Drive mini is a fast portable drive for those requiring that extra bit of space. Formatted originally for Mac OS X's HFS+, a small instruction is printed inside the packaging instructing users of other operating systems to visit their website for solutions to how to format the drive for their respective systems. Fortunately formatting it for Windows NTFS is simple enough, for me, but I can't see how average computer users like my dad would know. It would be helpful if a more helpful step by step instruction is included in the packaging, or better yet, just format it for Windows. After all, Windows still run on the majority of PCs. If you are a Windows user and have issues mounting the drive, right click on 'Computer' and click on 'Manage', then head to 'Disk Management', where you can format the drive and assign a drive letter. Voila. Minor usability gripes aside, the G-Drive mini is a fantastic looking piece of hardware. It is also solidly built. The metal protective shell doubles as one giant heat sink for passive ventilation which ensures that heat is dissipated quickly. Through the grills, you can almost peer inside the enclosure for a neat view of the drive itself. The drive itself is a standard 2.5" SATA 1TB drive made by Hitachi running at 7200rpm. A status LED sits just behind the front metal grills. Despite the liberal use of metal, the G-Drive mini is surprisingly lightweight. The IO ports are located on the backside and consists of two Firewire ports, a USB 3.0 micro-B port, one/off switch and power plug. Three cables are included in the packaging, two of which are Firewire variations (800 and 800 to 400) and a USB 3.0 cable. All three cables are about a foot in length, far too short in my opinion considering most USB plugs are located at the backside of a desktop PC. A useful case is also included. While the drive itself is bus powered, an optional power adapter can be purchased separately. So a very stylish looking portable drive the G-Drive mini is, but it won't do good if it doesn't perform well. 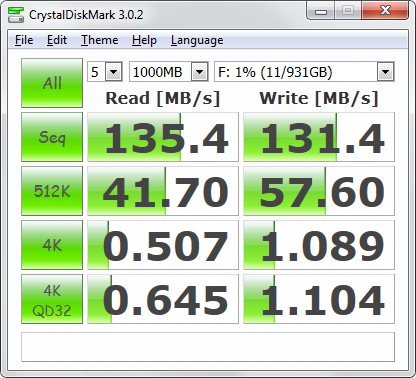 This is the first USB 3.0 drive I have ever used, so I was very impressed by its performance. Obviously, USB 3.0 bandwidth is plentiful, and the main bottleneck of the drive is still the harddrive itself, but at least you can now access the drive's real performance. As demonstrated in the benchmark test, the G-Drive mini was capable of averaging more than 130MB per second in both write and read tests. This is certainly a vast improvements over the USB 2.0 days when the bus was the bottleneck. All in all, the G-Drive mini is a stylish piece of kit with serious storage power. I've yet to encounter any issues, but a drive's reputation is in how long it can go before packing up. Mind you, it isn't cheap for a portable harddrive, and I am not familiar yet with how reliable Hitachi portable drives are (apart from that it also came standard on my ThinkPad), so I can't exactly give an opinion on its value yet. A typical 500GB version costs just north of £100, where as the new 1TB 7200rpm version I have costs £150 at the Apple Store.